We were extremely impressed with this company’s focus on customer service! Appointments were on time, questions were answered in a timely manner and followed up as promised! Technicians were friendly and ensured drop sheets etc used and cleaned up afterwards! Staff mentioned the importance of keeping customers happy and their actions confirmed this focus! It was refreshing to work with a company where you feel valued as a customer! We needed to replace our 15 year old hot water tank at our house. Since the hot water heater manufacturers won’t deal directly with the residences we contacted several HVAC installers, some of them recommended by the manufacturers. We got a bunch of callbacks and the one that stood out was Homebridge Canada Inc.
Mike/Homebridge sales was helpful answering our questions on a tankless natural gas water heater and a standard electric tank. Mike worked very hard to make sure his quotes were very competitive for both the gas tankless heater and the electric tank heater. When some points were beyond his scope he brought in Lance/HVAC specialist who explained what needed to be done for the gas hookups, gas line size, venting and best placement of the tankless water heater in our home. We decided to stick with a new electric water heater because the savings between heating water by gas tankless vs electric tank were only about $50 per year. I requested a 50gallon electric tank made by John Wood and Mike had no trouble finding one. Some of the other installers were giving me grief that only 40 & 60 gallons were available in the market now. Kyle and Steve/Homebridge Installers were friendly and enthusiastic and managed the installation in a very cramped area under the stairs along with some extra duty to move the heavy water softener out of the way. After the installation we had unexpected tank trouble giving us too slow heating time and substandard heat for the water. John/Homebridge Service Manager arranged for Craig/Homebridge Technician to sort out the problem. He got the replacement part ordered and had the water tank working full steam in a couple of days, working around a 3rd-party delivery service hiccup. Craig was knowledgeable in his field and shared advice on how to extend the life and care for the tank, best temperatures settings to fight off bacteria buildup, how to correct air pressure build-up, how to empty of and fill the tank with water without causing damage and how to inspect and change the anode rod without any water pressure mishaps. In the end we had it installed on a Friday and didn’t have it working properly until Wednesday. Although the experience wasn’t perfect, the delay was more of an unfortunate thing and they did strive their best to improve it. Based on their pricing and well-supported staff we would rate Homebridge 4 out of 5 stars and recommend them for your home comfort needs. Thank You...and a very "Happy New Years" to you and yours! The team at Homebrigde, from the service tech to the sales rep and the installers, were all professional. They arrived on time, got the job done in the time frame they estimated. I would recommend their products and especially their service, that they were able to provide. Thank you for the kind review and recommending HomeBridge Canada. Technician (Craig) showed up promptly, he was very friendly, courteous, and answered all our questions with his knowledge and expertise. Craig provided us knowledge and showed us the mechanics of our furnace so we could better understand and care for our furnace throughout the winter season. Would recommend Homebridge to friends. A very professional and prompt service. Smooth installation with a great price. Would definitely recommend! Thank you for the kind review on how we did you job. I really hope he is available for our next service call . Thanks Craig. . Thank you for taking the time to leave us this kind review. Thank you Paul for the kind review! 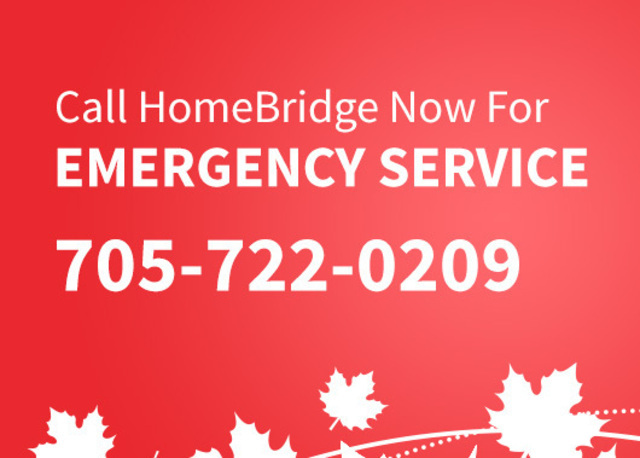 We at HomeBridge Canada look forward to providing your future service needs. Thank you for the kind review! We at HomeBridge Canada look forward to providing your future service needs. Replacement from old unit to new one and installing humidifier. Justin and James were very professional and organized, they took the necessary time to properly install the equipment. Thank you, for letting us know more about our team of installers. When you need service or have any questions please contact us at 705 722 0209. Thank you for taking the time and leaving us kind words. Founded in 2001 by two experienced HVAC technicians, HomeBridge Canada has grown steadily over the years by providing quality workmanship, value and timely installations of the industry’s best heating and cooling equipment. From humble beginnings serving the local communities to a well-respected regional fixture, HomeBridge has become a major player in the industry. Built on trust. When you are making a decision about heating and cooling equipment, are considering a new home furnace or air conditioner, or just want to do some maintenance or repair on an existing unit, you need to be able to trust the people who’ve committed to the job. You also want to ensure that they’ve got the knowledge and experience to get the job done right, the first time. We promise all of that. Our team. We’ve gathered together some of the best in the biz and created a team we are proud of. Our technicians are fully trained and fully licensed and are continually learning to stay on top of the latest trends in the industry. At HomeBridge Canada, you can be sure that you’re getting the best deal on the best equipment with the best service. When it comes to heating and cooling, we’ve got you covered.